This post is all about flowers, which in this case really are late bloomers as summer has turned into autumn a while ago. Flowers have been a popular accessory since who knows how long, so it´s no wonder that flowers were everywhere in the 1940's also. They were attached to hair and hats, made into brooches and used to accessorize every outfit from literally tip to toe. Flower accessories were made of any material posibble: different fabrics like felt and velvet, wood, palstic, seashells and metals both precious and scrap. And of course you could use real flowers too. I didn´t find any specific info why the flowers were a big hit back then, but I assume it had something to do with the cheerful nature and beautiful colors of the flowers. 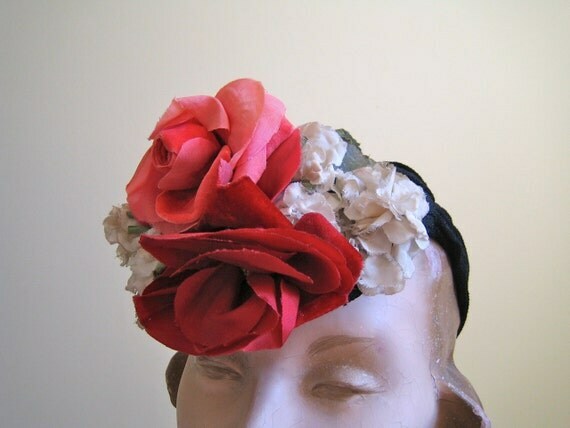 Also you could find both inspiration and material for your flower accessories everywhere. As a dedicated 40's girl I wanted something flowery myself. To make the accessory I needed the idea of a flower necklace and a huge portion of good luck. In a flea market I came across with this big plastic bag full of white plastic flower parts. These kind of flowers can be also detached from artificial flower bouquets or other similar decorational pieces. First slide a stopper bead and a yellow wooden bead to a stick pin. Twist the end of the stick pin into a loop with pliers..
..and add the jump ring to the loop. Attach the flowers (I made nine flowers in total) to the plastic chain with the rings. Or if you want to proceed you can do several with different colors!